Summertime can roll by so fast. Memorial day pops up and then before we know it, Labor Day seals in and closes out the good times. Sandwiched in the middle is a holiday that just sparkles, the 4th-Of-July. When I was a kid, there was something magical about the 4th. The red, white and blue banners that glimmered from porches made me happy. The summer humidity of the Midwest rolling down my back forced me to feel alive. The parades that marched brightly down the street were effervescent in their glory. Then there was the flag cake. We never had flag cake! Let's make this 4th-Of-July perfect by creating a flag cake or rather a giant flag cookie, because nothing says, "We Love America!" more than one pound of butter and 3 cups sugar. It's America's Super Cookie, and nothing else could celebrate the birth of our nation better! Step 1: Preheat the oven to 350 degrees. Spray a jelly roll half pan (approx 17.25" x 12.25") with baking spray. Line the jelly roll with parchment paper, so the paper overhangs the pan. In a stand-up mixer, whip the butter on medium speed for 3 min. Scrape the sides of the bowl and whip for 1 additional min. Add the sugar and mix for 3 min. Add the eggs one at a time and then add the vanilla. Mix well. Step 2: In a separate medium bowl, combine the flour, baking powder, and salt. Add the dry mixture to the butter mixture. Combine on a slow speed until smooth. Place the cookie dough on the jelly roll pan and spread until even and smooth. Bake for 15-20 min until the edges are golden and a toothpick comes out clean from the middle of the dough. Let the cookie cool completely. Step 3: With a hand mixer, cream the butter and cream cheese. Add the salt and lemon and combine until smooth. On the completely cooled cookie spread the frosting evenly. Let chill for 1 hour. 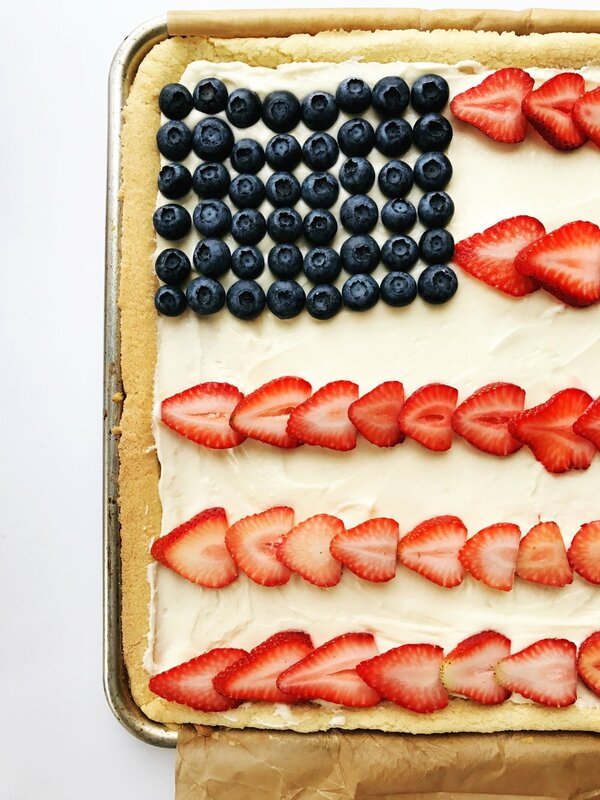 Add the blueberries and strawberries in a flag pattern right before serving. What could make the 4th-Of-July more perfect?